The residents of Owatonna, Minn., got an extra Christmas present last year – a brand-new, state-of-the-art laser tag arena, unveiled in late December inside the three-year-old Spare Time Entertainment Center. Residents of this city an hour south of Minneapolis can work off those holiday calories by chasing each other through a sound-enhanced, strobe-lit haunted forest, all while wielding glow-in-the-dark lasers. “This is the main growth vehicle for our center,” said Scott Hutchinson, the general manager at Spare Time Entertainment, which already boasted a popular bowling facility and an upscale pub-style dining area. Hutchinson explained that while bowling is still the main attraction, the new arena – which fits 24 players at a time for 15-minute sessions – aims to be a premium venue for birthday parties and team events. 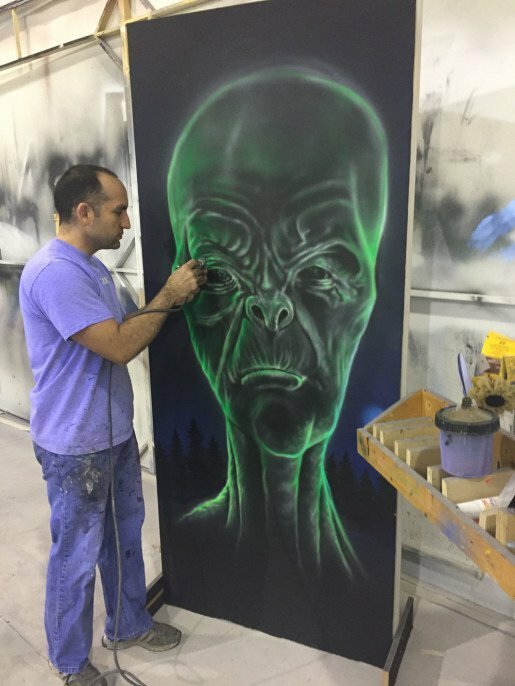 Richard Hidalgo, lead artist with Central-Florida-based Studio 41b Immersive Attractions. 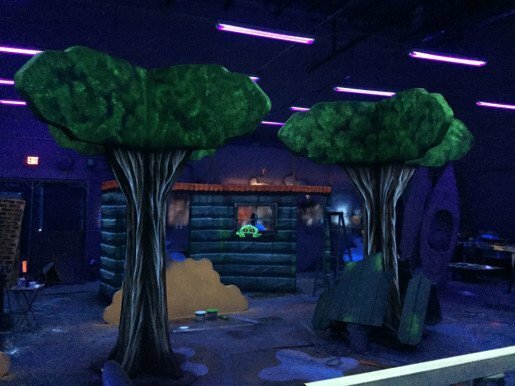 The company creates custom environments for laser tag arenas. That’s because the Haunted Forest is far more than just a place to run around and let off steam. To create and execute the complex, Spare Time turned to Central Florida-based designer Douglas Wilkerson, whose firm, Studio 41b Immersive Attractions, creates custom environments for every laser tag arena. When Wilkerson traveled to Southern Minnesota to meet Spare Time’s owners and devise a concept, he was immediately inspired by both the area’s rural beauty and the local mystery surrounding an abandoned summer camp, Skunk Hollow, which was rumored to be haunted. Studio 41b in turn referred Hutchinson to Laser Blast, which Hutchinson said is a leader in the industry with the best equipment on the market. Laser tag arena props from Studio 41b. The design company’s owner was inspired by both the Owatonna, Minn.’s rural beauty and the local mystery surrounding an abandoned summer camp when he traveled to the area to meet with Spare Time’s owners. Wilkerson found those narrative elements in the mysterious Skunk Hollow camp site. Tucked deep in the northern woods, Skunk Hollow was the stuff of local lore. Stories abounded of strange alien sightings, serial abductions, even the disappearance of authorities sent to investigate. That was just the intrigue Wilkerson needed: for the Spare Time arena, laser-armed guests venture into that spooky forest to take a crack at solving the mystery. A lead artist with Studio 41b paints a mural. Spare Time’s new laser tag arena, which fits 24 players at a time for 15-minute sessions, aims to be a premium venue for birthday parties and team events. The environment they came up with is believable enough to send shivers of excitement down the spines of all who enter. Apart from the visual theming, “for this project, we integrated lighting and audio effects packages that enhance the experience for the players,” said Czachur. Wilkerson explained that Studio 41b designed a series of tactile triggers, in which players’ footsteps set off spooky sounds – barking dogs, alien voices, growling bears – that keep the guest on edge. Tree props from Studio 41b. Aside from creating art in the dark, the company’s owner said the biggest challenge of designing an effective space like the Haunted Forest laser tag arena at Spare Time is the balance between visual aesthetics and the logistics of play. The company collaborated with Laser Blast on the trigger technology for sounds and alien voices that are set off by breaking an infrared beam. Even the smallest details were addressed, for example making sure the sounds of dogs barking can be heard from right behind a guest. Wilkerson said his company also mixed the soundtrack with Laser Blast’s Mike Ewald, and that the two companies experienced a great collaboration. “Everyone used their gifts and abilities and each company’s technology” to make it [the project] happen, he said. The grand finale is a 30-second period with fire, lightning strobes, sounds of an alien invasion and a crash landing sound. “Spare Time and Studio 41b all tied it together to make a wonderful experience,” Ewald said. The movie-style soundtrack plays with a storm sequence layered over the music so visitors feel a storm coming with low rumbles of distant thunder, the crackle of lightning, and the whoosh of wind blowing through trees. “We included strobes to help feel the lightning, and awesome subwoofers that make the place rattle when the thunder rolls,” Wilkerson added, referring to a professional-quality sound system. Throw in the pitch-dark of a laser tag arena, the eerie glow of the lasers, and the confounding maze design, and visitors are all but immersed in a Hitchcock horror film. 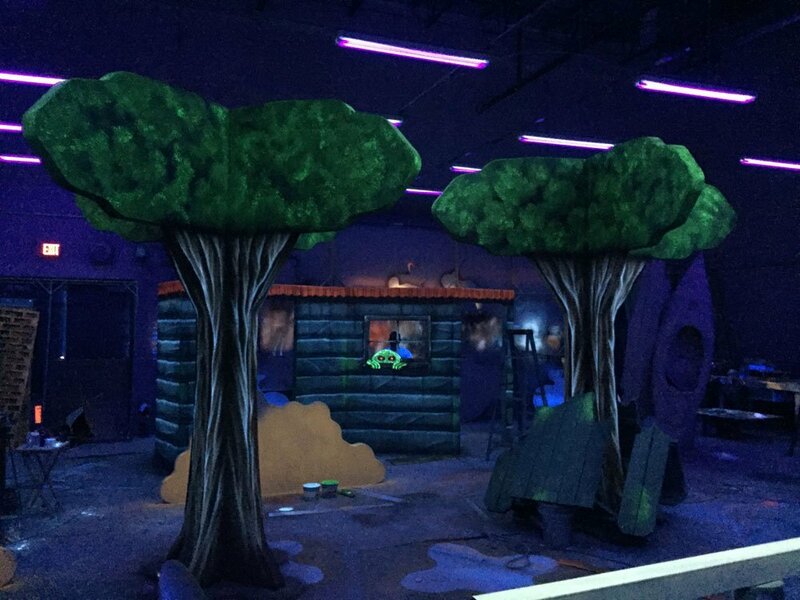 Because of custom design elements, The Haunted Forest laser tag arena at Spare Time is far more than just a place to run around and let off steam. 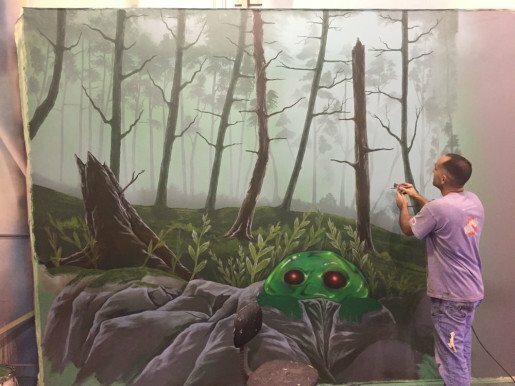 Czachur, who oversaw many of the artistic details involved in the visual scheme, said one challenge involved making sure the designs were eye-catching in the darkened ambiance of a laser tag arena. “Besides carefully planned artistic design decisions, we utilize paint with the highest UV pigment concentration, making it extremely sensitive to UV lighting,” said Czachur, who called it “the brightest paint on the market.” His team also installed those UV lighting fixtures in a strategic fashion to maximize the intensity of the paint. Fairness in play is an emphasis at Spare Time, said Scott Hutchinson, who explained that all players undergo a pre-game instruction session to ensure a good time for all. Every player receives a list of “do’s and don’ts,” then raises the right hand and pledges to play safe and have fun. 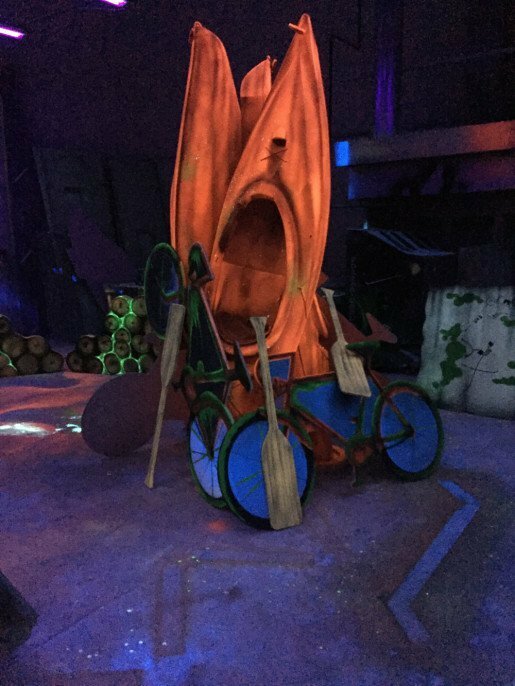 Fun, of course, is the point – which is why Hutchinson expects the Haunted Forest to be a winner with children’s birthday parties, festivities for the local softball teams, and other organized outings that Spare Time will promote with value packages. Given the arena’s success thus far, Hutchinson said he envisions additional facilities with an experiential theme, such as a rock-climbing wall. Highly customized, immersive laser tag arenas have proven to be big money makers, confirmed Wilkerson, explaining why his firm invests so much effort to make each project unique. “We get guests coming back for more. 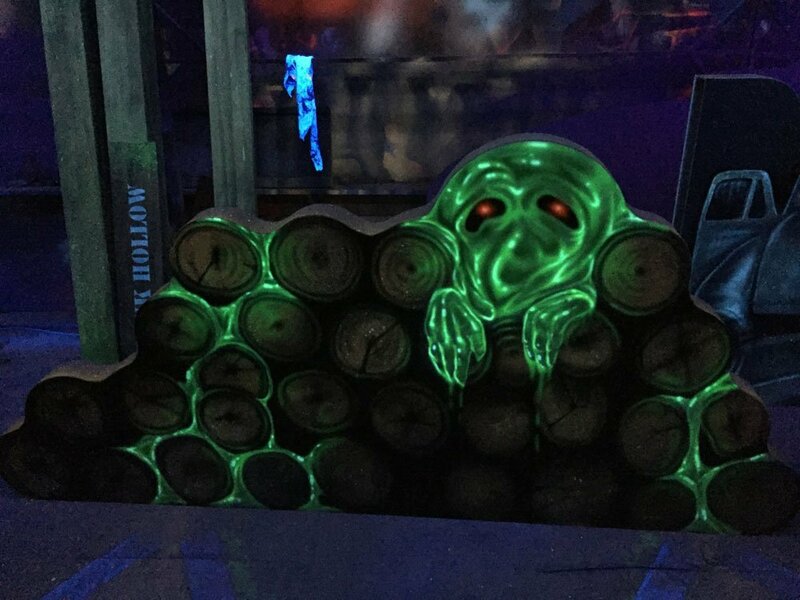 We wanted to bring something fresh to the laser tag experience.” Judging from the crowds dashing through the Haunted Forest, the approach has paid off.